My husband John Tanner (The doctor at Oving Clinic) had a place on the medical team for this marathon and asked me to join him. I love mountains and it would be my fiftieth birthday next year I would not want to come back frustrated that I had not tried to run the marathon so applied for and was given a place! 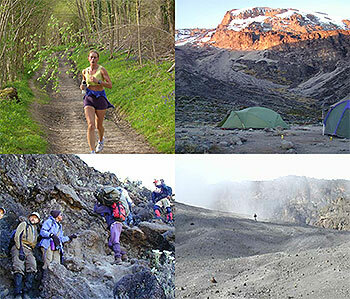 I decided to run in aid of two charities; The Everest Marathon Fund and The Royal National Lifeboat Institution. I would like to tell you a bit about these charities and why I am asking for your help in supporting them. Britain-Nepal Medical Trust: medical work in East Nepal, including community health and training with particular emphasis on women’s health, education and empowerment for minority groups. Nepal School Projects: school construction, vocational training, water systems, trail rehabilitation and community health in the Mahabharat hills. WaterAid (Nepal programme): clean water and sanitation in rural areas. I have decided to donate 50% of the monies I raise to The Royal National Lifeboat Institution (RNLI registered charity 209603). The RNLI relies solely on donations from the public to be able to run as there is no government funding for this important rescue service and as a keen sailor this is why I have chosen to support them. The RNLI’s running costs average around £339,000 a day. For every £1 raised, 85p is spent on operations and 15p is spent on generating income, this is a huge sum to be found every day. When you are in a tight spot and need their support (as I did recently) you learn to appreciate this valuable service. Last year RNLI lifeboats rescued almost 8,000 people, an average of 21 people a day. Not only do the RNLI need to find the money to run their fleets but also for training of their members of staff who are mostly volunteers. Training is what turns a volunteer from someone who is willing to save lives into someone who can do it well and safely. Only one in 10 crew members join the RNLI from a professional maritime occupation. That makes training all the more important, but it costs on average £1,214 to train each lifeboat crew member, each year. What will I put in? I will pay for all my costs myself. John will also pay for his cost. John is on the medical team that supports the runners. We will both be very happy to do a talk for anyone sponsoring after we come back. We can show you our pictures and tell the story. And of course there is the training …………. having done a fair bit of mountaineering and fell running I know what is involved but at an average of 50 miles/week my poor feet are finding life hard going. I promise to put in my best but cannot guarantee that I will make it. Having never run a marathon so I decided to book into the Leicester marathon as a training run. Other runs completed are: up and down Snowdon and Seven Sisters to Eastbourne and back. The Everest Marathon is listed in the Guinness Book of Records as the highest marathon in the world. The start line is at Gorak Shep 5184m (17,000 feet), close to Everest Base Camp in Nepal. The finish is at the Sherpa town of Namche Bazaar at 3446m (11,300 feet) and the course is a measured 42 km (26.2 miles) over rough mountain trails. It is the world’s most spectacular race and has been held twelve times since 1987. Although the course is basically down hill, there are two steep uphill sections. There may be snow and ice on the upper part and there is considerable exposure along much of the route. where you can donate directly online or drop in and see us at The Oving Clinic and make your donation in person. I know in this poor economic climate it is hard to think of others but the need is there. This is your chance to make a difference. And be part of an adventure in the process! !